Sometimes it can feel as though a conspiracy of superficiality looms over us like a candyfloss cloud dictating the kinds of conversations that are socially acceptable. At a dinner party I attended recently, the subject arose of how all the child abuse scandals had resulted in many people becoming disillusioned with the Catholic Church. Someone wondered whether, as a result, the nation’s spiritual identity had been thrown out with the bathwater, and I asked if a spiritual vacuum now existed with many traditional rites of passage being rejected but not replaced. The conversation was quickly diverted to someone’s daughter having her first Communion and how excited she was about getting a very expensive dress. Cue a lively discussion about Communion clothes, while the other discussion was abandoned. Superficial chit-chat and the deliberate avoidance of meaningful conversation always gives me a yearning for deeper encounters. I don’t think I’m the only one. I can do trivia, I can do gossip and I can, when the mood takes, be silly – but what I love are those surprising, stimulating, in- depth conversations that leave me feeling energised. My response to the lack of these conversations is a forum where people can talk openly about deep topics and philosophise to their hearts’ content without fear of having to dumb it down or fluff it up. 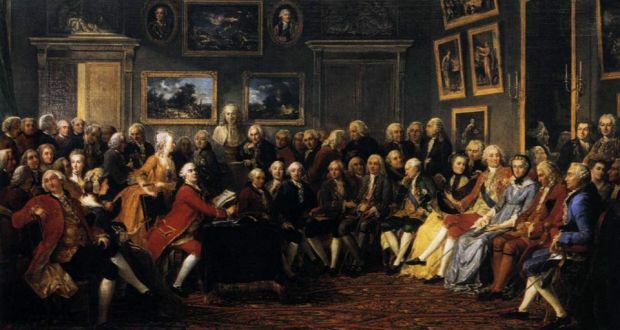 At a time of profound change and challenge in this country, hosting conversation salons, a philosophy-based series, seems the perfect antidote to the superficiality conspiracy. These, if all goes to plan, will be forums for transformational conversations, gatherings where curious, open-minded, open- hearted people can have encounters that inspire, challenge and stimulate in a relaxed atmosphere of exploration. The idea is inspired by the French Enlightenment salons of the 18th century. The right kind of conversations can shape our future, allowing us to experience a kind of human alchemy where boredom, apathy and inertia are transformed into inspiration, momentum and action. I have absolute faith in the wisdom of the ordinary person. We are surrounded by everyday gurus, who need to be given space to share this wisdom. Alain de Botton once spoke about the unrecognised prophets in bedsits everywhere, and how it was his mission to get them published. It is my mission to get them to start attending conversation salons and sharing their ideas. The main aim of these salons is to make people more aware of their own innate wisdom. We are all natural philosophers, to a greater or lesser degree. Philosophy is not stuffy or obscure but something as natural as breathing. My father was a philosopher, a Mayo farmer who left school at 14. He asked the big questions about life and death, creation and human existence. A few years ago, I attended a workshop in Dublin with a group of inner-city grandmothers hosted by a professor of philosophy. Those women were more than able to hold their own in that discussion on Socrates, Plato and the human pursuit of happiness. Socrates wasn’t elitist. He went up to strangers in the street and asked them if they could live a better life or be happier. His legacy was a challenge to explore what we contribute to society and to improve the quality of our own lives. By asking ourselves challenging questions, we get answers that lead to our growth, opening us up to new possibilities and creating more purpose in our lives. These are tough times for this country, and today’s social challenges require fresh thinking to help us come to terms with the dilemmas of 21st-century living. We need to turn the crisis into an opportunity and to negotiate a new reality. These conversation salons might just mobilise all that human potential that is lying dormant and offer a wonderful alternative to the pervading cynicism and denial. In his latest book, The More Beautiful World Our Hearts Know Is Possible, Charles Eisenstein suggests we as individuals can in times of great social change or crisis make the world a better place by small but powerful acts. I know, like him, I risk being called a Pollyanna but I’ll take that risk if it means affecting change. Last summer a friend wondered if my conversation salons were just going to be talking shops. There will certainly be plenty of talking and philosophising, but with the purpose of bringing about real change in participants’ lives. There will be brainstorming, people will hopefully have some lightbulb moments and emerge with the impetus to tackle life’s predicaments. There’s nothing superficial about that.